Be sure your food is cooked evenly and thoroughly with the Atosa ATMG-36 Heavy Duty Stainless Steel 36" Manual Griddle. 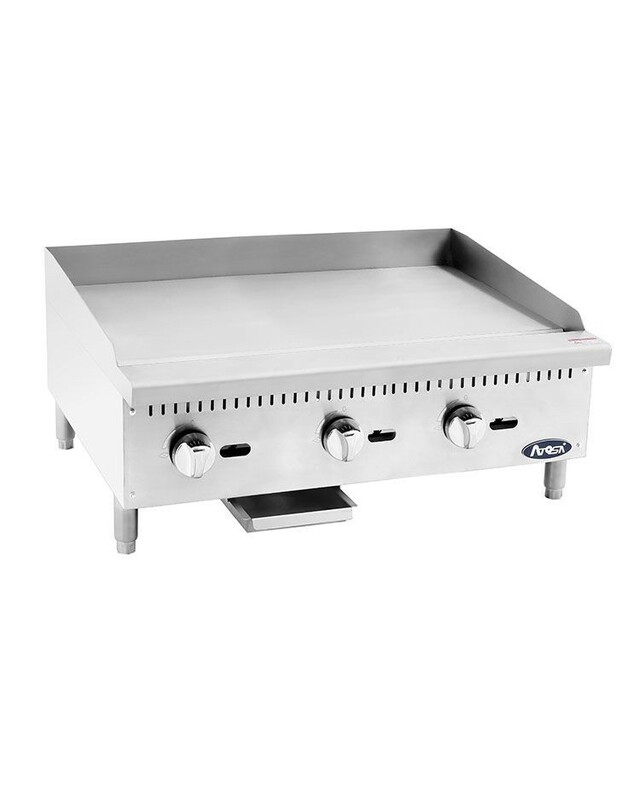 Designed with a stainless steel radiant plate, this griddle delivers fast and even heat distribution while its 3 independent manual controls ensures energy efficient use. To enable fast ignition, it is designed with a standby pilot light that ignites instantly. This griddle is manufactured from stainless steel, so it is exceptionally durable and will not get rusted or warped over time. As an added bonus, it has adjustable stainless steel legs so it can be easily positioned to your desired cooking height. In addition, it is easy to clean and its outer wall helps contain splatters. 38-3/5" x 31-1/10" x 18-2/10"